An accessible and lively introduction to the field, Law, Justice, and Society: A Sociolegal Introduction, Fourth Edition, explores the relationship between legal systems and other social institutions using a distinctive sociological point of view. 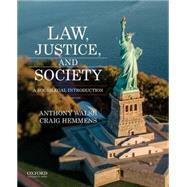 Authors Anthony Walsh and Craig Hemmens provide detailed discussions of the various ways in which law impacts people based on race, class, gender, and age while also introducing students to the origins of the law, the history and development of the American legal system, the sociology of law, court structure, and the difference between civil and criminal law. Anthony Walsh is Professor of Criminal Justice at Boise State University. Craig Hemmens is Professor and Chair of Criminology at Washington State University. Each chapter opens with an Introduction and closes with a Summary, Discussion Questions, and References. Chapters 2-6 and 8-14 end with Cases Cited. Is the United States Soft on Crime? What Is a Vice Crime? The Concept of "Compelling Government Interest"
Can the Rights of Both Gays and Religious Dissenters Be Protected? Justice Anthony Kennedy: The Most Powerful Man in the United States? Interpreting the Constitution: Strict Construction or Living Document?